Our small semiprivate group classes are 50 minutes and limited to 4 people. Or tailor your lesson to your goals and reserve a private 55 minute session. 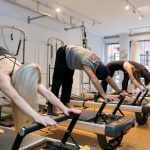 Pilates includes more than 500 controlled, precise movements, each designed to stretch and strengthen muscle without adding bulk. They require concentration and deep, coordinated breaths, working both body and mind in harmony with one another. Pilates is good for EVERYBODY. general fitness, strength, sports specific and injury prevention. We have experienced senior level pilates teachers that will help you reach your goals. Group classes for all levels or one on one instruction – You’ll find what you need at core de vie. You can also call Core De Vie @ 617 720 0411 to reserve your spot.